Who On Earth Eats Slugs? So if not humans, who’s supposed to eat slugs? Whoever it is, they’re clearly falling down on the job. 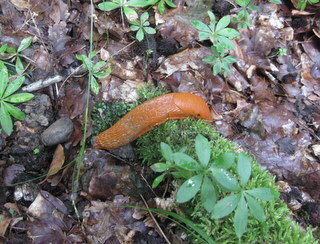 Worst of all – and here’s the thing – slugs eat mushrooms. No, not eat – feast on, demolish, scarf, GOBBLE THEM UP. And they do it in a flash, before you can say Boletus edulis or Cantharellus cibarius. 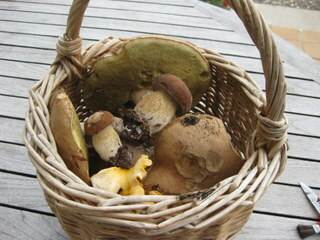 Down comes the rain, on go my wellies and out with my basket I go, hopes of rich fungi finds riding high. But all too often the slugs beat me to it. The only evidence that there was ever a mushroom there at all is a gnawed stem and a disgusting, slimy, sated gastropod draped comatose over the remains. Yuck. Occasionally I get in first. My favourite finds are ceps, short, stocky little beasts with brown or beige caps and pear-shaped, almost obese stems. Instead of gills, like most mushrooms, ceps have tiny, sponge-like spores. They can vary in size from a few centimetres across the top of the cap to something the size of a small sombrero. I pounce on them, cut them loose with my trusty mushrooming knife, brush or trim away any bits of moss or leaf mould or bits nibbled by slugs, bear them home and brew them up into a little ragout, with loads of garlic, parsley and a schuss of lemon juice, or toss them briefly in hot olive oil and scatter them over a salad. Previous: Previous post: What’s the Point of Growing Broad Beans?